"Brains On!" host Molly Thomas, left, and producer Marc Sanchez enlist kids to help with a demonstration on stage. Families have an insatiable hunger for entertaining and educational events. Show up to any popular story time or children’s music show, and you’ll find a highly engaged crowd of kids and their deeply appreciative parents. Now, as more families discover kids’ podcasts, the audience eager to connect with podcasters in person is growing. Producers of these shows are working hard to catch up with the popularity and strategies of their grownup counterparts. 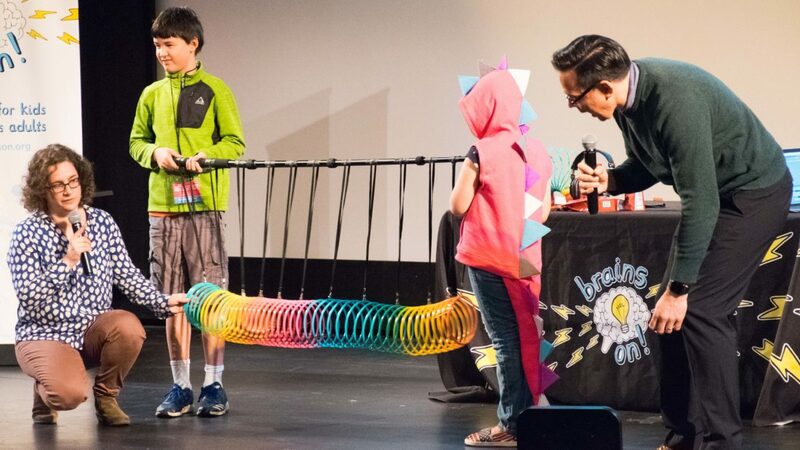 If the success of the first-ever kids’ podcast festival is any indication, kids’ podcasts are poised to make their own leap on stage. 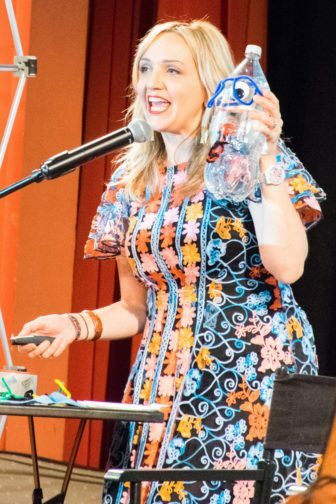 This spring, The Mega Awesome Super Huge Wicked Fun Podcast Playdate brought five shows and over 400 kids and parents together for the first time. The two-day event was the brainchild of Amy Macdonald, director of community engagement at WBUR in Boston. Macdonald had been tossing around the idea of putting on a podcast festival for over a year, but it felt overwhelming. Then, WBUR launched Circle Round, a folk tale podcast for kids. 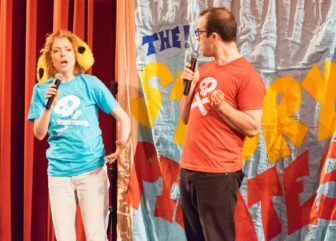 Macdonald put two and two together: A podcast festival for kids. Macdonald assembled a lineup of mostly public media podcasts: Two of the most popular — NPR’s Wow in the World and Gimlet Media’s Story Pirates — along with Brains On! from American Public Media, But Why (Vermont Public Radio), Eleanor Amplified (WHYY in Philadelphia) and Circle Round. The festival was April 28—29 at the 450-seat Coolidge Theater in Brookline, Mass. Tickets were sold for individual shows ($10), Saturday or Sunday ($20), or the full festival ($40). Shows for Story Pirates and Wow in the World sold out, and the others came close. The festival featured a diverse set of performances. Circle Round presented two stories with live music, Wow in the World featured Brooklyn band The Pop Ups and Eleanor Amplified put on a radio play. Others were built on audience participation. Brains On! invited kids to make sounds and do demonstrations; But Why taught bird calls; and, Story Pirates made up a story on the spot based on suggestions from kids. “Story Pirates” Joanna Simmons, left, and Nick Kanellis made up a story on stage during their festival performance. Producers of Story Pirates are the seasoned pros among the podcast set. The audio show grew out of a children’s theater company that adapts stories written by kids. Now, they’re working to find the right balance for a podcast live show — meeting expectations for highly produced audio while keeping an audience entertained in real time. Story Pirates has tried it both ways. They recently recorded a Los Angeles show featuring comedian Patton Oswalt, which was “a heavy lift” in terms of both live and post-production, Overtree said. “There are so many moving parts between actors, music, sound effects and all the problems of recording live sound,” he said. The Podcast Playdate show was not recorded for an episode. By contrast, the podcast Book Club for Kids, which began as a radio program on KPCC in Pasadena, Calif., leans heavily on live shows for content. Host Kitty Felde arranges kids’ panel discussions at book festivals, schools and even at the National Archives. “The energy from the crowd adds a special zing to the taping,” Felde wrote in an email. Macdonald described the shows at WBUR’s festival as having three things in common: Interactivity, variety, and timing. Each show involved the kids, whether they were shouting out suggestions from their seats or coming up on stage for demos. Activities were timed out to keep the audience focused. The performances were jam packed. They all clocked in at a tight 45 minutes, so each day’s event ended before the theater’s midday matinees. The Podcast Playdate made $6,000 in revenue for WBUR, some of which will be used to put on next year’s event. Macdonald plans on bringing in sponsors and partnering with children’s publishers to include authors. Meanwhile, podcasters are continuing to develop their live show strategies. Thomas performs during WBUR’s Podcast Playdate. Other shows have experimented with bringing podcasts into schools. For example, Podikins, a Canadian storytelling and activity podcast, created an interactive mystery show for a third-grade classroom. Libraries, bookstores and other venues with children’s programming could provide an alternate route for podcast appearances, outside of theaters. The variety of spaces could create multiple models for successful live event strategies. That means there’s a lot of room for experimentation, within a podcast genre with plenty of space to grow. The stories take place in different areas of the uniited states as well as other countries ,this is why I entitled the series , welcome to the wonderful world of reading magic tm. I am in need of a producer now. I have a show in mind using podcasting to make the stories if possible to come alive now on stage. I would prefer them to go to cartoon animaters for tv programing or an app that offerss audible stories for children to use their own minds to create pics of their own with descrptions of people, animals, and places around the world.. I have been a Disney girl all my life and now i want to share my 27 yrs of work somhow. Thank you..I also have a lot of childrens and adult poetry.